Good machine finds stuff well made bad points no control box cover coil is hard wired for 35 pound more a coinmaster or garrett can be bought with interchangeable coils and accessories made for them. The device is usable on all kinds of different terrains. If one happens to be in a crowded place, well, it also comes equipped with ¼ inch jack for headphones. I have owned the Tracker iv for about 3 years now and every time I go out I'm impressed. Don't be fooled by the simplicity in this machine! The discrimination is a bit rough, but having owned other detectors it works as well or better than the others. Sensitivity is awesome. I've dug quarters at 12+ inches on wet fresh water beach. I've also used it in the water(coil only) and it worked just as well as dry land. So far to date I've found: 2 Indian head pennies, 2 mercury dimes, a silver Roosevelt, uncounted clad, fishing lures, countless relics and other odds and ends. Point being every year I consider a new detector and this one keeps on producing. Worth every penny!! Although I no longer use my Tracker IV, it was my first "real" metal detector. I picked mine up for 30 bucks on Craigslist and it was money very well spent. I will never regret my purchase one bit. It paid for itself within the first hour because I found a 10K wedding band right out of the gate at an old ball field. At the time, I knew NOTHING about metal detecting and this was the perfect starter machine for me. It's simple, lightweight and very easy to learn, understand and operate. This is NOT a high end machine but for what it is, it's a great, capable and reliable machine. It has two audio tone target ID, two hunting modes, all metal and disc, as well as very adequate discrimination and sensitivity adjustments. It's quite functional. I usually run it in disc mode with the discrimination set around 11-12 O'clock to knock out iron but retain nickels and GOLD (and of course, pull tabs but hey, if you want to find gold you have to dig nickels and trash with any detector). The trick with this machine is to first READ THE MANUAL and do the air tests so you can get a clear understanding of how the controls work and what the machine is telling you about different targets. Then, get out there and practice. Learn the language it speaks and in no time you'll know what to dig and not dig based on the tones it makes (most of the time). You'll have to learn to pinpoint with it but once you get the hang of it, it's easy. I also highly recommend getting a decent digging tool and a hand held pinpointer to locate you target once you dig the hole. Again, this all gets easier with practice. If you have kids who hunt with you, the Tracker IV is the perfect detector. It's simple, lightweight, easy to master and FINDS TREASURE. Although it's considered a "starter"/entry level unit, I can honestly and unequivocally state that my Tracker IV taught me the very basics of metal detecting and taught me well. It also found numerous silver coins. One was a silver Rosie at about 9 inches down in red clay. For some reason, my Bounty Hunter machines hit much deeper than normal in red clay. I would say the average depth with the Tracker IV is around 4-6 inches. It also found an 1886 Indian Head Cent hidden under a bunch of pull tabs, two gold rings, a silver ring, numerous fake/plated rings and at least a thousand clad coins before I upgraded. (I also dug a ton of trash along the way but that comes with the territory). Overall, this is a great entry level detector for anyone and an excellent machine to introduce kids to the hobby with. It's not an expensive machine at all and you can pick up the Tracker IV pretty regularly on Craigslist and Ebay at really low prices. I've seen them as low as 25.00 and as high as 125.00. It's a great detecting training device for anyone too. If you learn this machine well and learn it's language you will reach a point where you'll intuitively know what it's telling you by the tones it makes. You'll have a pretty good idea of what to dig and not to dig. If you have good spots it will find the goods. No machine can find what isn't under the coil no matter how much you pay for it. It won't hit as deep as higher end machines but sometimes you do get lucky if the soil and target conditions are just right. I know mine surprised me more than a few times. Also, if you get truly serious about this hobby, you WILL outgrow this machine and want something more advanced just as I did (I'm on my 4th detector). Then again, if you find you don't really like being outdoors and digging in the dirt on a regular basis, you won't be out a ton of money and you can always keep it around to find lost keys, jewelry, etc. If you have kids, this machine will definitely entertain them for hours on end as well as help them find buried treasure. I don't believe there are too many kids out there who haven't dreamed of digging buried treasure at one time or another. If your kids are like mine, the Tracker IV will be a great machine for them. If you're new to the world of metal detecting, it's may be a great, fun machine for you as well. Well my cousin talk me into getting a metal detector he suggested the Bounty Hunter IV. I went out today and after a about 20 minutes I found a 8 inch spike 4 inches down then I found a pull tab, but my next find was 23 cents and after that a old .243 hull. Not a big treasure but for me to get some extra exercise this lil baby is gonna be fun. I can't wait to get out tomorrow and see what I can find. Save your money and buy a better detector. Better equipment = more treasure, which = more coin in your pocket! You see, full circle! Jus' my 2 cents! I purchased the Tracker 4 based on the numerous good reviews, and the fact that, apparently for the money you won't get better. I have used the Vallon metal detector in Afghanistan hunting for IED's so I know what performance is. ( a strange transition I know). Anyway back in civvi street! The Bounty Hunter did not disappoint, straight out the box I dialed in the recommended settings from the manual and went into the garden, found 12 pence and an old saddlers badge. he next day I hit the same beach and found 2 tent pegs and £2.71 in change. The only negatives I heard when originally researching the BH was that the depth wasn't that good, well it pulled out a WW2 copper pin badge smaller than a 5 pence piece, from wet sand at around 6 inches, to some that may not sound great but lets not forget it costs £125 in the UK and even less in the states, and to be honest no one wants to be digging for 10 mins on every ring pull that's a foot down. The BH does feel very light and almost cheap, but don't be fooled, it is very robust and sturdy. Every time I think to myself that the BH is too much of an 'amateur' machine and I would be better off with a Minelab or similar, I take it down the beach and it never fails to deliver and maintains my faith in the machine time and time again. As for detecting on land this thing will pull iron relics at over a foot, I had an ancient spoon handle and a strange lead/ gold token in my local woods at around 5 inches on all metal mode. To conclude, if you have any doubts just go for it, the machine will pay for itself soon enough. 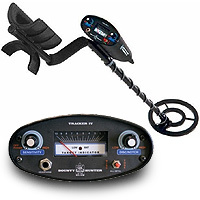 I bought the Bounty Hunter Tracker IV when I decided to get into metal detecting. The good- quality construction, USA-made, easy to use and not expensive. The bad- NO depth with any kind of discrimination, and the Target Indicator needle is pretty much useless. This detector is good for finding shallow clad coinage and recovering dropped metal items. It's also good for getting the "feel" for how a metal detector works. Most of my detecting is focused on finding older items and coins from old house sites. These sites almost always have a high level of trash iron in the ground, so "all metal" mode (the only way this machine can get any depth) is not useful. If you are looking for deeper, older coins, this machine is generally not going to find most of them. Would I recommend it? It all depends on what you want to do with it. For the price, this is an OK detector, but it just doesn't work for my preferred type of detecting. I will be upgrading soon. I have heard that the Bounty Hunter's (the poor man's metal detector). For the money Bounty Hunter's I think is the best!!! I have found countless change, 1c, 5c, 10c, ect. 1.Citizen Watch, ect. E.J. Templin from Las Vegas, NV. urchased it and read the instructions. Went out at nigh with wife and flashlight and hits everywhere but no ring. Next day, I put out a skeleton key and copper cone. I practiced on sweeping and setting controls. I started sweeping the areas. Because I had learned to sweep slowly and steady, I found it in the mulch bed. Granted is wasn't deep, but it picked it up near the gas meter. Both wife and I are very happy. We were thinking about returning it, but now we will keep it for use at the cottage and lake. I give it 5 stars, but probably for the ring I found. Really its worth 5 stars for light weight, cost and effectiveness. Like my dad used to say, learn your tools and they will provide perfect work!! Thanks BHIV, you saved me from heartbreak!